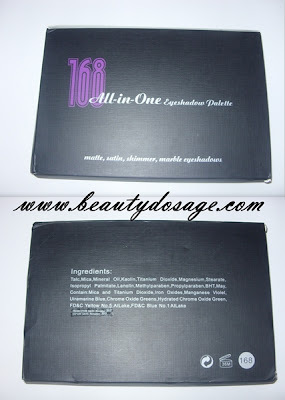 This review is going to be of the 168 colour eye shadow palette . This is a a palette you can get off of many websites for a really cheap price but this one by far the price I have seen. A palette with various choices is always great if you’re a beginner of even a makeup artist and this just way above variety. It has shades ranging from warm to cool colours. It also has a variety of blue’s, green’s, brown’s, pink’s etc. basically all the colours under the rainbow! In palettes like this, it’s always a hit or miss with colours and it’s the same with this. Not every single colour will be pigmented. Some would be sheer, some wouldn’t show up at all and some would be the most pigmented colours ever. Especially for the price I think that’s acceptable. The scent is nothing significant to worry about and the longevity of the shadows is pretty great especially if you have a primer underneath! The shadows are a little bit chalky however but isn’t bad to the point where there won’t be anything left on the lid. The shadows are extremely bendable which is important with any powder makeup. You can definitely create any look with these, may it be a dramatic one of a simple neutral look. The size of each shadow is kind of small in my opinion and also I find a lot of similar colours in the palette. The packaging of the palette is kind of tacky. The shadow trays aren’t attached to the palette but instead it comes off. This might be good in a way if you are a makeup artist and want to carry you shades in your hand while you work. The palette does however get dirty pretty fast and would need frequent cleaning. This is a product you can find in various sites online. Coastal scents & BH cosmetics also sell these but buying them from eBay and tmart.com would definitely cut the cost down considerable! Lasts a really long time especially with an eye primer underneath! I would definitely recommend this product to you. The CON’S of this products aren’t anything much to worry about. 168 colours are a great variety for anyone and when it comes with such a great price, that unbeatable!